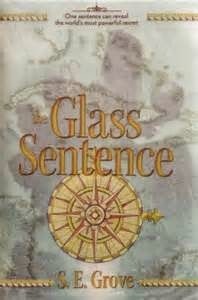 The Glass Sentence, by S.E. Grove (Viking Juvenile, middle grade on up, June 2014), is perhaps the most ambitious and original time slip book I have ever read (and I have read more than three hundred). It took me several weeks to read it, and not because it is long--487 pages, but more because the world-building is so complicated that my busy mind wanted time to digest between immersive reads of it....And this is not to be critical of the book, because I did not find that this strange-to-me way of reading detracted from my enjoyment, but it is something to keep in mind when matching the book with readers who will love it. When Sophia's great-grandmother was a girl in Boston, back in 1799, the world fractured in time. A great disruption brought the past to some places, the future to others...and history ceased its linear progression. And a new era of exploration and map-making began, that ended up taking Sophia's parents to a far of time and place, leaving her with her cartographer uncle in Boston. Slowly she learns to read map of memories held in glass, maps of earth, of water....but she is not permitted to stay sheltered in New Occident. Instead, she when her uncle is kidnapped, Sophia must follow a trail of cartographic riddles across a time-struck continent...a journey that will take her to the end of the known world, and a map that might change everything once again. It's a journey that brings new friends, adventures of all sorts, wild flights of imagination to delight the tourist heart of the fantasy reader. And interspersed with Sophia's story we see what is happening to her uncle, the tortured prison of someone with a time shattered backstory of her own. So the thing with this book is that there is So Much Story, and so much to learn about the world while following Sophia, that it really cannot be gulped down. And it requires patience to learn to be in that world....many pages of patience before the twistings of fate gather enough momentum to really get the story rolling. But it rewards the reader lots and lots with its imaginative delights and great characters. And the premise of the shifting times is genius--and one reason that the book was slow to read for me is that it invited more daydreaming and speculation than was good for page turning. It really does take time to get going, though, so you have to trust that it will be worth it to try to make sense of everything. And so, though this is a middle grade book for kids in grades 5 and up, it isn't going to be for every middle grade fantasy fan. Give it to the kid who, like Sophia, daydreams strange worlds...the thoughtful kid, who's a fast and confident reader, who looks at reality slight slant-wise. Or give it to grown-ups who love the way the best fantasy books for kids open new windows in the mind. My middle grade speculative fiction comrade from last year's Cybils Awards reading, Stephanie Whalen, recommend this one in her School Library Journal Review to those who loved The Rithmatist, by Brandon Sanderson, and found it comparable to Philip Pullman's Dark Materials trilogy. I don't disagree, but to me it gave an even stronger feeling of similarity to the Monster Blood Tattoo series of D.M. Cornish in the sheer splendorous details of its imagination. I have to say, though, that I personally admire the book more than I love it with the sort of cozy fondness I feel for my favorite books--it really is almost too much of a good thing in the elaboration of its imagination for my taste. I love your descriptions of the book (especially this one "It's a journey that brings new friends, adventures of all sorts, wild flights of imagination to delight the tourist heart of the fantasy reader. ") , but it also sounds like a book that you need a long chunk of time to really enjoy. I'll keep this in mind for when that opportunity arises. Sounds verrry cool. I do have a hard time with very elaborate worldbuilding, though, so I'll make sure to read this one when I have a big chunk of time to devote to it. The book as object is indeed lovely. And the world is great & detailed & weird.